It would be somehow unsatisfying for a monumental book about one of cinema's greatest intellectuals to overly precis its subject's oeuvre, to make that life and career too convenient, simple and straightforward. Thus, in its vast complexity For Ever Godard satisfies as a kaleidoscope of academia, interrogating the man, the work and the legacy, but it does not necessarily open up Godard's career to a wider audience of potential film-goers and DVD purchasers. Divided into four major sections, the twenty-two chapters do not provide a chronological so much as thematic analysis of Godard's work. In essence, the chapters are the many pieces of the jigsaw that form the director- although this particular director has many possible jigsaws to be made from his fifty year career. For Ever Godard opens though with an eye-catching and most accessible illustrated filmography- a marvellous piece of work!- which firmly establishes the framework inside which the rest of the book functions. Once the essays proper begin though, the tone shifts quite dramatically to an at times rather "dense" narrative which can transform the subject under discussion from a clear sharp image into one of fuzzy obscurity. An example of this is Keith Reader's 'asynchrony, seen as a temporal form of alterity, is a key trope in post-structuralist thinking...' (p.72), which, by way of an exposition, is for me too "heavy"- the equivalent of serving solid dumplings as a starter: all very nice in small amounts, but with the rest of the feast to come a trifle off-putting. Other essays, though at times overly wordy, suffer involuntarily from referring to texts beyond the average reader's awareness, such as the frustratingly unavailable Histoire(s) du cinéma, which prevents a close affinity with the text from being made. These comments made, For Ever Godard is an appropriately focused work, drawing together many loose strands not previously linked. One example of an innovative approach to Godard's work can be found in a chapter detailing his relationship with museums, the strength here being the way the author draws the reader's peripheral awareness to bear on one particular aspect and therefore provides enlightenment- surely the role of any critic. Another particularly good chapter concerns 'The Written Screen', and Godard's use of writing within his films, which paves the way for a creative 'scripto-visual essay' (pp.234-248) which re-arranges frames from Godard films to form 'an accursed share of the world of images that is Godard's art' (p.233). Surely even Godard himself would have approved of this. Perhaps the difficulty faced by the twenty-four contributors to For Ever Godard is the sheer diversity of the work of a man who, as Philippe Dubois reminds us, 'started out as a film critic' (p.232) yet who would go on to make films at the origin and heart of the New Wave film movement (A Bout de Souffle), complex cinematic social pieces ( Vent d'est) and later television films like Grandeur et decadence d'un petit commerce de cinema . What is accomplished in For Ever Godard is a panorama of academic study, an in-depth linked group of writings about specific aspects of Godard's career. Without the magnificent illustrations the book would be, frankly, heavy-going, but the images act as a re-inforcement of the points being made as well as a reminder of the very visual nature of Godard's cinematic practice. As he approaches his eightieth birthday, Godard is perhaps unlikely to make further forays into filmmaking, which is a great shame. His legacy though, as For Ever Godard reminds us, is an indisputably rich one- and one that will continue to baffle, challenge and above all intrigue audiences interested in film and the processes of its construction. At 461 pages, For Ever Godard is not a book to be read in one sitting (and not even in one week) but is one to act as an aide memoire, should it be needed, of a man who, to all intents and purposes, IS cinema. If it is for this reason alone that For Ever Godard is acquired, then it is reason enough. 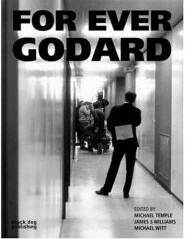 'For Ever Godard' is published by Black Dog Publishing.